Bleary from a night of hard drinking and trying to outrun the law, a truly unruly feller's eyes crack open slowly. As the fog fades, he realizes with a sudden onrush of dread that he's lying in a coffin and a raven is trying to peck through to get to his eyes. Breaking free of the plywood prison, he stumbles out into the wide open plains of the great American West, having been left for dead by whatever two-bit posse thought they'd done him in. Bastards hadn't even bothered to bury him correctly. With only his long underwear and a strong will to live, Gangrene McFiddlesticks begins searching for wood and stone to try to craft a shelter or some kind of hunting tool. Sadly, his escape from the grave will be short lived as he immediately stumbles upon a rabid badger. With no weapons or proper clothing of any kind, our doomed outlaw McFiddlesticks decides to turn yellow and high tail it in the other direction... directly into the waiting maw of an angry black bear. The bear and badger feast on Gangrene's corpse. It's for the best -- he was never cut out for life on the frontier as a rancher or farmer. 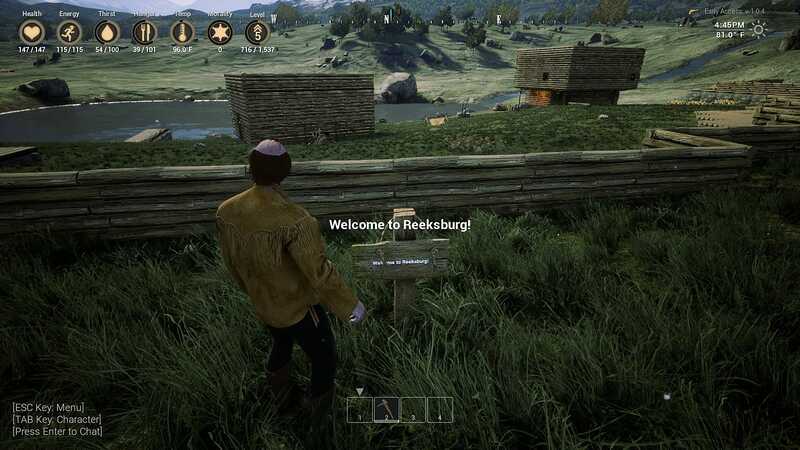 My opening moments in this horse and lasso-rendition of the survival genre were baffling and hilarious, but before long I'd have Gangrene 2.0 up and running to build a sprawling ranch estate and conquer the west. 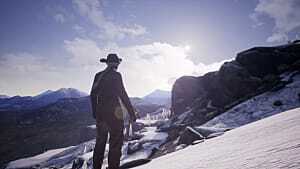 Given the popularity of recent titles like Far Cry 5 and Red Dead Redemption 2 it was only a matter of time before we saw the wild plains and mountains of the west turned into a survival game. Here's the one main thing you need to know before trying out the early access Outlaws Of The Old West -- if you've played Ark, you already know the ins and outs of nearly everything this game has to offer. The harvesting items and crafting recipes are astonishingly similar, which shouldn't be surprising because the same developer is behind both titles. 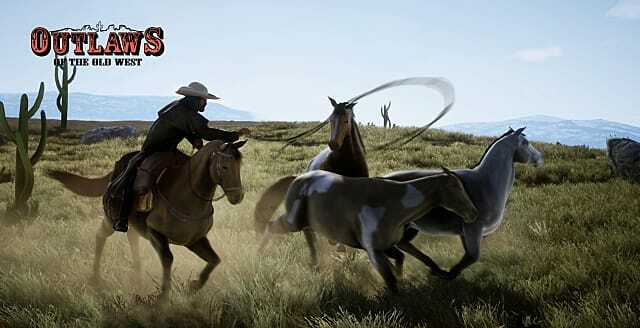 The laser rifles and dinosaurs are just replaced with lassos and horses to tame. Now, that being said, there are some key differences worth noting. Outlaws features noticeably better animations when harvesting crafting sources like trees and rocks, which become broken up and collapse. The survival aspects are (at the moment anyway) also much, much more forgiving than other games of this style. In all my time playing in either a single player or PvE server, I never once felt like there was a chance I would die of thirst or dehydration. Crafting has seen a bit of an overhaul, as you can now queue up crafting projects and they keep running even when the menu isn't open. Individual crafting recipes don't have any animations, but this does free you up to fight, run around, or do other things while objects and resources are crafted. There's still quite a bit missing from the full experience since this is an early access launch, but a tutorial really would have been nice, even for people who are coming over straight from Ark. 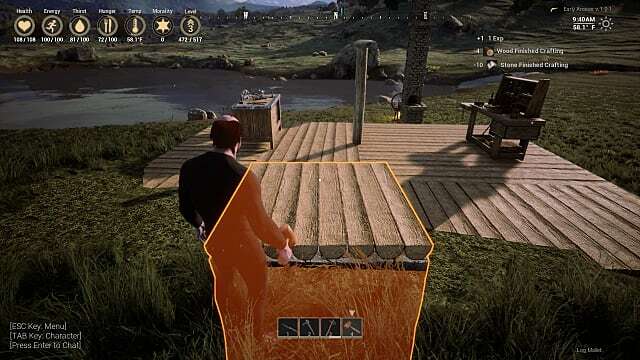 Some items are crafted straight from the inventory menu for instance, some can only be crafted at specific types of benches, and others are crafted by holding right-click to bring up a separate crafting wheel while holding specific objects like a log mallet. 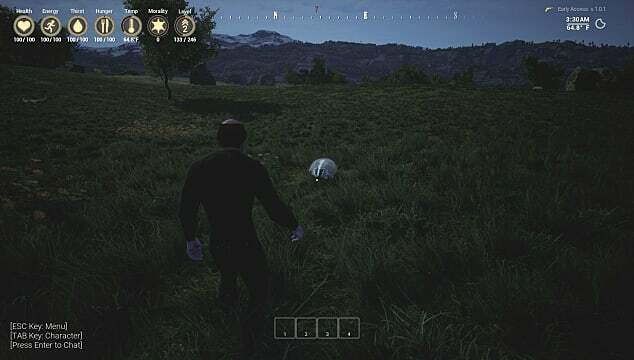 That segmented, non-streamlined system could be extremely frustrating for new players to figure that out through trial and error if they haven't played all the other survival games before. After a week of playing I still don't know how the shovel is supposed to work, which is annoying, because sometimes foundation objects don't line up properly on the rolling landscape when you're trying to build a house or a wall around your property. Mechanics and UI aside, Outlaws is plagued by an absolute horde of bugs that need to be worked out in the coming months, from animals flickering in and out of existence to truly bizarre AI behavior. At one point before finding a spot by a water source to start building a town, our friend McFiddlesticks found himself cornered by two wolves while armed only with a makeshift spear. Death number 2 seemed imminent... but after being whacked once with a spear, they both just stood there and let me stab them to death without ever attacking. That bug worked out in my favor, but others are far more infuriating. The worse was logging in one afternoon in to discover my inventory was completely empty. The 5 hours of crafting and harvesting I'd engaged in the night before were all wiped out in an instant, for no apparent reason. If I hadn't been working on this article, I would have rage quit and never picked Outlaws back up. Inventory item bugs are plentiful beyond that instance, as sometimes crafted items stay in your inventory after placing them, so you can just set down an infinite supply of whatever object you just made. You'll find yourself falling through floors and getting stuck in walls if you build multi-story buildings as well. After learning the ropes on a single player server I went into the actual online games to find a mostly empty wasteland. Despite the currently low player count, griefing is still a problem, but not in quite the way you might expect. Rather than having a menu option to dismantle your crafted objects, cowpokes are supposed to craft a sledgehammer to destroy building segments in a single hit. The problem is that sledgehammers aren't keyed to your structures -- they work just as well on other player's buildings as on your own, and are incredibly simple to craft. You just need a metal work bench and a handful of wood and iron ore to make one of these wrecking balls of destruction. One guy who has a sledgehammer equipped can swiftly take out an entire town in minutes that took days for a team of people to build. The game has only been in available early access a week and there have already been four big patches released, which is both good and bad. Obviously, the developers are committed to making this a game that works while quickly respond to fan feedback for fixes. On the other hand, the fact that it needed so many patches in such a small amount of time -- and there are still so many major bugs -- makes it clear most players should steer clear for awhile until the game is more stable and closer to ready. When you look past the bugs, you get a big satisfying map, with lots of different biomes that will frequently make you think of Red Dead 2. That's easily the biggest selling point, in fact. If you wanted more control over how to build your ranch in the epilogue of Red Dead 2, or if you just weren't keen on how Red Dead Online played out, then there's plenty of reason to try Outlaws... in a few weeks when more patches have arrived. Unfortunately, the setting and a few crafting tweaks are the only elements really different here overall. Everything else is exactly what you could get from Ark, Dark & Light, or Atlas. If you like that style of game where you have to figure out how to build up an encampment while surviving the wilderness, there's no reason not to try out the wild west version. If you frequently find yourself wondering exactly why you are chopping down a billionth tree to craft a bigger component in these types of games, nothing about Outlaws Of The Old West will make you re-think your stance, however.